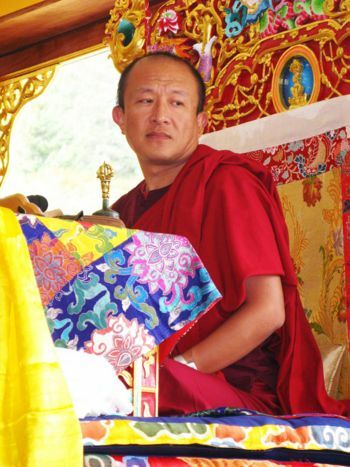 Dzongsar Khyentse Rinpoche (Tib. རྫོང་གསར་མཁྱེན་བརྩེ་རིན་པོ་ཆེ་, Wyl. rdzong gsar mkhyen brtse rin po che) — the principal incarnation of Jamyang Khyentse Chökyi Lodrö. Born in Bhutan in 1961, Thubten Chökyi Gyamtso, also known as Khyentse Norbu, was recognized by H.H. Sakya Trizin as the third incarnation of Jamyang Khyentse Wangpo, the founder of the Khyentse lineage, and the immediate incarnation of Jamyang Khyentse Chökyi Lodrö. He received empowerments and teachings from the greatest lamas, including His Holiness the Dalai Lama, the 16th Gyalwang Karmapa and his own grandfathers, Kyabjé Dudjom Rinpoche and Lama Sönam Zangpo, but his main master was Kyabjé Dilgo Khyentse Rinpoche. The Khyentse tradition being non sectarian (Rimé), he received teachings from masters of the the four main schools of Tibetan Buddhism. He later attended London's School of Oriental and African Studies. Working tirelessly for the preservation of the Buddhist teachings, he has created centres of learning in Bhutan, India, the Far East as well as in Europe, Australia and North America, while supervising his traditional seat, Dzongsar Monastery, in Eastern Tibet. Dzongsar Khyentse Rinpoche is also a filmmaker. He has directed The Cup (1999), Travellers and Magicians (2003), Vara: A Blessing (2013) and Hema Hema (2016). 15-16 February 1992, Berlin, ?? 10-11 March 2018, London, The Future of Buddhism: Challenges and Opportunities in Modern Society. View first talk and second talk on YouTube. This page was last edited on 5 December 2018, at 09:43.